Another ski season is upon us and once again the world’s ski regions have dug deep and splurged hundreds of millions of euros, dollars and francs on upgrades and new developments to increase our skiing and boarding pleasures for the winter ahead. A new gondola lift being built this winter at Tignes, to create a new connection between the resort’s Brévières and Boisses areas, will replace three lifts that will be dismantled and will also operate in the evenings, but it will do so without staff in its base station. “Thanks to the OWA (Operation Without Attendant), this new gondola lift will run without operating staff in the bottom station from 5.00pm to midnight,” a statement confirms from the resort owners of Compagnie des Alpes. Sweden’s Sälen ski area is set to receive what owners SkiStar are describing as “Scandinavia’s most modern eight-seater express chairlift,” along with new ski runs and expanded snow-making facilities in time for next winter. SkiStar are spending on Sälen’s Hundfjället sector as it is located less than ten minutes from the new Scandinavian Mountains Airport, which is under construction and currently on course to receive its first flight in December 2019. The new operators of the Winter Park ski area in Colorado have announced the biggest spend in the resort’s long history. A massive $28.2 million is funding a new ten-person gondola, replacing the key Zephyr lift, as well as snowmaking and other upgrades. The money is coming from the resort’s new operators, the Alterra company, which snapped up a dozen leading North American ski areas last year and has announced plans to invest $555 million into them over the next five years. What Big White resort staff claim to have been “Canada’s oldest and most popular triple chair,” the Powder Chair, is being upgraded to a quad in time for the coming ski season. The previous lift, installed nearly 40 years ago in 1979, provided an estimated 15,868,476 rides. The $3.9 million lift is part of a $10 million spend this summer on upgrades at the BC ski area, the biggest single-season spend in the last decade. “After all, when was the last time someone spent $10 million to show you a good time?” commented Michael J. Ballingall, Senior Vice President of the Big White Ski Resort. The Saalbach ski area, in Austria’s Salzburgerland region, is removing its Kohlmaisgipfelbahn gondola lift and replacing it with a brand new, state-of-the-art gondola. The resort already operates more gondola lifts than almost any other ski area on the planet, but this time the new lift will be replacing an old one, rather than a chairlift or drag lift, so the overall number of gondolas won’t be increasing. The new Doppelmayr-built lift will include a large number of improvements including street-level access and the uplift capacity increased to 3,200 people per hour, more than double the previous lift’s capacity. As mentioned in one of our news stories in this issue, Italy’s Dolomiti Superski region is spending €90 million ahead of the coming winter on half a dozen flashy new lifts and lots more snowmaking improvements, but the region is also unveiling some new ski runs for the coming season. 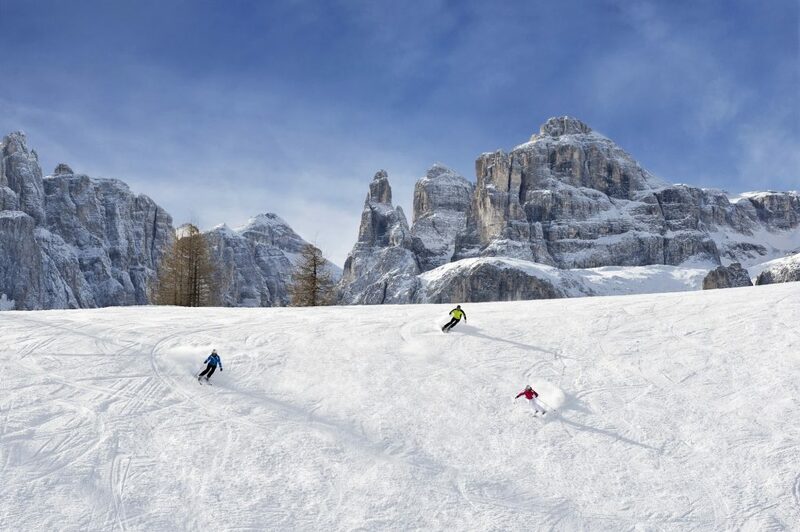 A new slope, the “Panoramica Druscié”, has been built in Cortina d’Ampezzo, while in Pozza di Fassa the “Aloch” race slope will be transformed into a giant slalom piste suitable for competitions. The new “Signaue II” slope is being added at the Three Zinnen Dolomites ski resort, while in the Alpe Cermis ski resort in Val di Fiemme, the new “Busabella” slope will welcome guests from the beginning of the season. Finally, the new “Wastl Huber” ski run at the Gitschberg-Jochtal ski resort will flank the new “Ski Express” cable car. A key lift in the Saanenmöser–Saanenwald–Saanerslochgrat sector of Gstaad’s large ski area has been upgraded to a new, state-of-the-art gondola with some world-first features this winter. The new two-stage is one of manufacturer Doppelmayr’s luxurious “D-Line” designs with ten-passenger cabins and technology that ensures an ultra-smooth, quiet ride. Unique to the new lift will be real glass roofs on all the stations. The cuboid roof with its large surface area will, in future, offer the possibility of retro-fitting a media façade with one further option being to project moving images onto this.